"Fortunately, Linse was an avowed Anti-Nazi"
Dr. jur. Walter H. Linse (1903 - 1953) lived under two dictatorships in Germany. His ideals "Justice and the Rule of Law" put him on a collision course with both of them. in West Berlin and abduction to East Berlin. Dr. Walter Linse in the Butyrka Prison in Moscow, 1953, shortly before his conviction for anti-Communist activities and his execution. Against the second (Communist/Soviet) dictatorship he fought openly, from what he considered a place of safety, West Berlin. But, the Communists sent four agents from East Berlin to West Berlin. They assaulted and kidnapped Walter Linse on July 8, 1952. He was never seen or heard from again. We know now that he was interrogated for 18 months by the Stasi and the Soviets, in Hohenschönhausen, Karlshorst, and finally the infamous Moscow Butyrka Prison. There he was sentenced for spying and anti-Communist activities, and executed in December of 1953. He was just 50 years old. Dr. Walter Linse's fate remained unknown until after 1990, when secret Russian files were opened, by the compassion of a Dr. Hennig, who himself had served time in a Russian Gulag. Upon review of his case in 1996, the Russian Federation declared Linse's kidnapping and conviction as wrongful and completely exonerated him. Under the first dictatorship (the Nazis) Walter Linse worked in the Chemnitz Chamber of Commerce (IHK) on the unfortunate "cleansing of the German economy from Jewish influence" - according to Nazi Government Edicts. Grave injustices were committed - but not by him. There is evidence that Linse tried to get fair compensation for the Jewish owners, argue against outright confiscation, help sell inventory or facilities, and help in other ways. His notes to the IHK files however were written for Nazi-Eyes and hide his attempted fairness toward Jews. Sometimes the files even sound hostile. It takes dedication and understanding of the circumstances at the time to look under the camouflage blanket to find the truth or see the difference between his words in the files and his actions. He was very careful then - and as a result, he survived the Nazi period. Of course, we must address the question whether he was a Nazi collaborator, a small wheel in the machinery leading to the Holocaust. I believe that the evidence, documents and testimony in his support, as summarized below, show his Anti-Nazi stance. This Website shows actual copies of many documents (mostly in German), as listed in in the Document Overview (Click Dokumente at top). In addition, there is evidence that Linse belonged to an Anti-Nazi Resistance Group named "Ciphero", which remained highly secret. Details in the summary below and in Chapter 7 (in German). Today, more than sixty years after his execution in Moscow, critics (in my opinion supported by German Communist/Stasi Sympathizers) accuse Dr.Linse of having been a Nazi activist, perpetrator, and criminal. They base their judgment on the very files, which were written by Linse, for the eyes of his Nazi superiors. The critics refuse to acknowledge many indications that the files were a cover for Linse's Anti-Nazi attitude and actions. I do not wish to criticize the critics, but let documents and witnesses from his times speak to us. Walter Linse, ... Nazi-Activist etc. I am a nephew of Dr. Linse, knew him and his wife, and visited them often in Chemnitz and once in West-Berlin in 1951 - one year before he was kidnapped. However, I was too young to understand his activities, before, during, or after the war (WW II). To others, as a relative, I am presumed to be prejudiced in the uncle's favor. Conversely, having experienced the Nazis and the Communists myself, I am also uniquely qualified to judge circumstances under which Linse lived and worked. I have tried to be objective. In an attempt to find the truth, I began to study records and publications by and about Dr. Linse and made contacts with surviving Jewish families in Germany and in USA. The evidence, some already known, some new, is presented here. It shows to me that Walter Linse was a good and reasonable man in this entire period from 1938 to 1952. He helped victims, in opposition to both of the dictatorial powers under which he served, i.e the Nazis and then the Communists. As a result, he was in danger. Walter Linse did not always feel to be at risk - a misjudgment, which eventually cost him his life. Nor did he create a record of his compassionate deeds (to clear himself later) - he simply acted. In my mind, these are the marks of a true hero. This website presents a summary and documentation about Dr. Linse, the anti-Nazi. Indications are, that the critics are wrong. 8 Was Walter Linse a Nazi Activist or Criminal? "Fortunately, Linse was an avowed Anti-Nazi". One should be puzzled by the wording (italics) in Linse's letter. What does he mean? In my research, I found the documents which prove that the answer is: The parents were already dead, Linse knew that, and, naturally, Aschers did too. Yet, Linse hid that detail from his Nazi superiors. He judged that only "living expenses for the parents" was an acceptable reason for the release of the funds. He thus gambled, that the Nazis would not check whether the parents were living. Obviously, this was a conspiracy against the Nazi-bosses. Perhaps even more persons knew about the details and placed themselves at risk also, in real acts of heroism. The letters exist. (2a, 2b, 2c in German). Sonia confirmed that Alfred's parents were in fact dead. Aschers' very good friend Horst Lantzsch, who also helped with Aschers 1939 escape, came to America in 1951, and at first lived with them in Manchester, NH. In 1952, they heard about the kidnapping and disappearance of Dr. Walter Linse (Article in Time Magazine, July 1952). To view the article, click "Lantzsch", left near the top, and then doc 3c. That fall (1952), Horst Lantzsch wrote a letter to West Germany's Chancellor, Dr. Konrad Adenauer and requests that the Chancellor help Dr. Linse, ...who, even at great personal risk .... helped to get my friend Ascher out of the KZ [concentration camp Buchenwald] ... A man[Linse] with such noble convictions does not belong into a jail. In 2010, Horst Lantzsch was also honored posthumously by the Jewish Anti-Defamation League for his own courageous help for the Ascher family. In his book, Benno Kirsch analyzed in great detail, how Dr. Linse supported the Jewish inventor and engineer Gilel Reiter (then about 60 years old), for almost five years from 1939 to 1944. Linse wrote countless memos and letters to extend Reiter's residency permit, so that Reiter could continue to market his inventions for improved manufacturing devices. Linse thereby prevented Reiter's deportation. Linse tried to obtain an indefinite extension ... denied. Instead, only a three months reprieve was granted. He tried to free Reiter from the requirement to display the yellow Star of David on his coat ... denied. Linse explained that engineers were in such short supply due to military demands, and therefore one should make long term use of Reiter ... denied (No such acknowledgement of a shortage was tolerated ) ... and so on, for almost five years. None of the descendent families knew the name of Dr. Linse, even though their names appear on Chemnitz business listings or in Linse's files. Some now deceased family members had actually met with Linse. Apparently, he was not known as a cruel Nazi-Activist. Generally, Linse tries to be fair to the Jewish business owners. He helps to find qualified buyers, obtains estimates of the value of inventory, buildings, machinery, makes recommendations how to collect outstanding payments, reviews sales contracts. He argues for fair compensation "so as not to grant an undeserved competitive advantage to the Aryan buyer" (He could not write: "... it is simply wrong to confiscate anybody's property."). Sometimes he documents the remaining funds for the owner. For Aschers, he helps to release frozen assets from the shoe store liquidation (2, above). Walter Linse and the "Chamber" do not have executive powers, only consulting functions. City-, State-, and Reichs-Government offices have power to govern, and these are under Nazi Party control. Linse realizes that liquidation or sale of a business robs the owners of their livelihood. But the removal of Jewish ownership from business or the expulsion of persons of Polish nationality is government edict and over these matters, he has no influence. Linse's critics claim that he became a member of the NSDAP, because a "Membership Card" was found. My research shows that the card referred to is a "File Card", not a "Membership Card". The difference is very important, because membership begins, when the "Membership Card" or the Party Book is handed to the Applicant, personally. That, says Linse, he was able to avert - and therefore he was not a member, even though, under pressure from superiors, he did fill out an application form. I believe this is factual. (see doc 6f, including a copy of the File Card). In July 1945, i.e. after the collapse of the Nazi-Reich, Dr. Linse wrote what he knew all along, that elimination of Jewish businesses was an injustice and that any compensation or return of the property must be regulated on a state or national level. He thought that immediate restitution under the post-war circumstances was not possible. Significantly, in 1945 the Soviets reinstated Dr. Linse in the Chamber of Commerce, and later even promoted him. He was even appointed to head a panel to "Denazify" other former Nazi-Party Members. That could not have happened, had he been a Nazi-activist or perpetrator. There would have been many witnesses to testify against Linse, object, denunciate, report or convict him. Like many others, he would have been prohibited from exercising his profession, arrested and sent to jail, or worse. Four years later (1949), in East Germany, the new Socialist/Communist SED Party was in power and demanded conformance, just as the Nazis did earlier (1938 - 1945). Trying to create "Socialism", that government simply confiscated businesses and called their policy "the Expropriation of the Expropriators". There was no room in that political structure for an independent thinker or a Liberal Democrat with a strong feeling for justice. This time Walter Linse elected to flee to West-Berlin - attempting to help victims of this new form of oppression - from (what he considered to be) a place of safety. A detailed 14 page document describes a secret antifascist resistance group named Ciphero. Written in June 1945 by its founder Edgar Fischer, it contains a list of 34 members, including # 16, Dr. Walter Linse. The document explains various actions of the group to resist the war effort, to gather intelligence, and to assist individuals. Two independent East German police reports of 1951 also mention Linse's membership in Ciphero - and do not question the group's legitimacy. For some historians there is not sufficient evidence of the group's activities. They try to dismiss Ciphero as a retroactive, self-serving creation. I disagree with this evaluation, because it unfairly demands that the group's secret Anti-Nazi activities be somehow documented during Nazi times. Such documentation would have been far too dangerous. It is honorable and heroic, to resist an unjust government. Someone doubting Ciphero's legitimacy, should first show prove that there were indeed no acts of such resistance - or be quiet and let the detailed claims stand. 1938-1944 Chapters (1) - (5) above show that Linse, from his Chamber of Commerce office, renders substantial help to the Jewish families Ascher and Reiter, thereby resisting Nazi policies and edicts. There are also other examples. He puts himself at considerable risk. 1940 A typed Nazi-Party File Card (doc 6f) for Linse exists. On it, his first name is misspelled and any updating entries (marriage, change of address) are missing. Linse explains later that he was pressured to finally apply to join the Party, but that he had always avoided being handed the membership card or book (which is the official moment the Nazi-Party membership begins) - thus, officially, he was never a member. Communists and Soviets accepted that explanation. Linse was aware that his application may be seen, under different rules, as equivalent to membership. However, Soviets and Communists, in power after the war, accepted Linse's explanations. 1945 East-German Communists and the Soviets nominate Linse to participate in a panel for "De-Nazification" of a professional group. Obviously, he was known not to have been a Nazi, and certainly not a Nazi activist or perpetrator. Otherwise he would not have been chosen to "sit in judgement" over others who had been Nazis. 1945 Soviets reappoint Linse to the Chamber of Commerce and later promote him to its Business Manager. This they would not have done, had he been known as an Anti-Semite and/or Nazi-Activist. The Soviets were very sensitive to such information and could have known or would have known of it, had it existed. 1945 A Jewish medical doctor, Dr. Adolf Lipp, who had somehow survived the Nazis and the war in Chemnitz, visited Dr. Linse in the Chamber of Commerce, to discuss possible restitutions of Jewish businesses. If Linse had been a Nazi Activist, Criminal, or an Anti-Semite, such a visit would have been unthinkable. 1945 Other Jewish survivors returned to visit Chemnitz. They could have reported misdeeds or crimes by Linse to the Soviet authorities, had he been guilty of any. No such reports against Walter Linse exist. 1945 A complaint: Linse was supposedly an NSDAP Member and was seen wearing the Nazi-Party lapel button. Communists and Criminal Police investigate, but find nothing. They find that the complainer may have been prejudiced against "Academic types" ... No action against Linse developed. 1946 The Antifascist Democratic Block receives testimony about Dr. Linse: "...in the NSDAP [Nazi Party] , the SA or similar organizations he was not. ... He was an opponent of the Nazi-System..."
"... according to our information, Linse was always an opponent of the Nazi-Ideology. That is what we want to stress especially." 1948 A complaint to the Mayor of Chemnitz: "When will they de-nazify Walter Linse ...?" Accordingly, Linse was questioned by the county De-Nazification Commission. He fills out a questionnaire and denies in it to have been a NSDAP (Nazi Party) member. Logically, not having been a member, he does not need to be de-nazified. 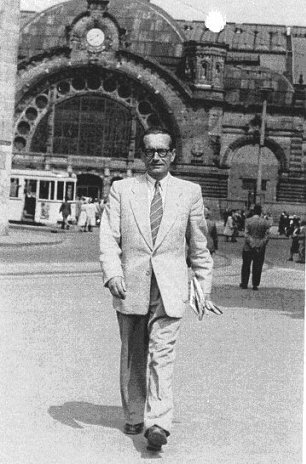 1949 Linse (with his wife) flees to West Berlin and later finds work at the Association of Free Jurists (UFJ). There,he gathers information about the East German Economy and also advises East German citizens regarding their problems with the Communist government. The Association has ties to the CIA. 1952 TIME Magazine (USA), July 21, 1952, Page 22 and news services around the Free World report on the brazen kidnapping of Dr. Linse by East German Agents in West-Berlin. (see doc 3c, English) Following this publicity there were no notices or protests against Dr. Linse's alleged activities in Nazi Germany. To the contrary, there was a supporting comment - see next item. 1963 Alfred Ascher in a newspaper interview for the Manchester Union Leader (NH, USA) acknowledges Linse's help and states: "Fortunately, Linse was an avowed Anti-Nazi". 2010 Horst Lantzsch, posthumously, is recognized by the Jewish Anti-Defamation League (ADL) in USA for his support of Aschers in their escape from Nazi Germany to Belgium. Now, please, judge for yourself: Was Linse a Nazi perpetrator, activist, or criminal ? Or do you find sufficient indications that he was an Anti-Nazi, who helped Jewish people, when he could? *Many of the items in Chapter 8 are recited from the book about Dr. Linse by Dr. Benno Kirsch (In German, see Literature).